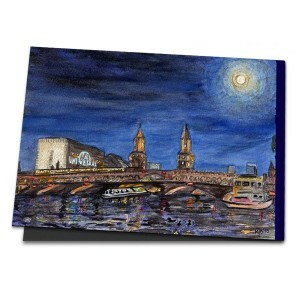 Lou's energy worked and catapulted me into painting on the banks of the river Spree. It was autumn, the evening cool, but not cold. The reflected light of the big city and the full moon danced on the water's surface. Barges, smaller ships and party boats with dancers passed by, sometimes in one direction, sometimes in the other. From here to there, cars swept over the bridges, as did the subway carriages - yellow, brightly illuminated and full of passengers: Berliners and people from all over the world. And as I glanced at the bridge as if spellbound, suddenly all the lights were extinguished, even the full moon had disappeared - the world suddenly appeared a bleached grey, blue and black. Everything was dark and gloomy and empty of life, the bridge towers protruded into the night, the great river flowing quietly. But over there on the other side, the headlights of a hefty watchtower immersed the long, white wall, crowned with rolled barbed wire, and the 'death strip' in front of it in a glaring, cold light. Zooming into a house just behind the Oberbaum-Bridge, I saw clearly from my balcony the oversized sign "You are leaving the American Sector" and how on this historic November night, initially just a few people, then small groups and finally masses of people crossed the bridge. Hearing the reggae from my music system, which I had dragged onto the balcony and turned up loudly, I came back to the present. Astonishment, relief, happiness - the Oberbaum-Bridge had finally become a bridge, the Spree once again a gateway to the wider world, West Berlin was no longer an island, and the other river bank no longer a forbidden country. "If that's your favourite Berlin motif, then so it is. I'd have chosen other places." Lou's voice sounded as cheeky as ever. "But couldn´t you paint the picture in the daytime?" - "Nee", I said, attempting my Berlinese, "on the contrary, because only at night is the Oberbaum-Bridge a really important motif to me."